Ah, summertime – the beach, the sand, the sun. Your skin however is thinking – The sunscreen! The sweat! Those late summer evening BBQs that leave you too tired to wash your face when you get home!! All these can be a doozy for your skin. Clarisonic to the rescue! 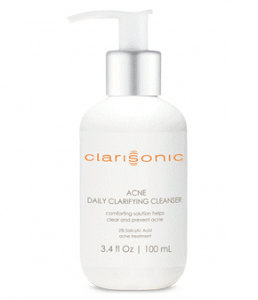 With their brand new Acne Clarifying Collection, you can be on your way to clearer, cleaner skin in just a few days. When I first started using the Clarisonic, I actually got a bad breakout on my chin, but as I read in the comments of their website, this is common for some people as their skin tries to purge out impurities. So hang in there if this happens to you. I’m on week 3 of using it now and am definitely seeing an improvement. My skin is smoother, my pores look smaller and I feel like my lotions and serums absorb better into my skin. The Mia 2 and Acne Cleansing Brush Head are definitely soft and non-irritating, and the Acne Daily Clarifying lotion is wonderfully soothing to use. Still not convinced? In a consumer study, 82% of people who used the Clarisonic for just two weeks saw an improvement in the overall condition of their skin. Plus Clarisonic offers a 90-day guarantee if you’re still not happy with your results. What do you have to lose? Except that blemish. Kate Bayless is an editor, writer and reviewer with cleaner, clearer skin than she had two weeks ago. Follow her at katebayless.com or @katebayless. Note: We received a product sample for review. Seems good product, but Will this Clarisonic work on all kind of skins?